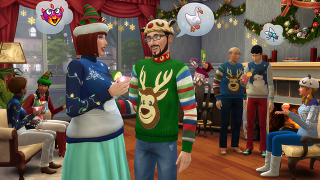 It’s the most wonderful time of the year and now that The Sims 4 includes festive décor to pair with the holiday season, we thought it would be fun to share some ways your Sims can throw the ultimate holiday party. First things first, let’s be sure that you have the Holiday Celebration Pack successfully installed. If you have yet to do so, you can follow the instructions in our careers blog http://www.thesims.com/news/ts4-newcareers to unlock this new content. Now that the holiday content is in your game, let’s begin. When prepping for parties, I like to be sure my Sim’s house has plenty of space for guests to mingle. I start by re-arranging some of the furniture to create open space for my Sims to sip on nectar juice and dance the night away. Then I like to browse the holiday décor and spruce up my Sim’s home with some festive flare. A few of my favorites are the Snowman Lawn Ornament (that I prefer to put inside rather than out on the lawn), the Wreath and of course, Christmas Lights! Now that my place is set for the holidays, I can’t wait to show it off to friends and family. Before we get to planning our party, I want be sure to tidy up the house and get my Sim ready. I make sure they shower the grime away, get into just the right mood, and (of course) put on the ugliest holiday sweater in their dresser! 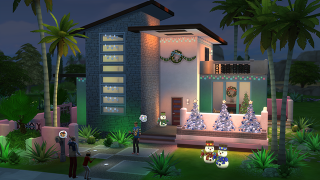 Now, let’s set up a holiday party to invite some Sims and bask in the holiday spirit. From the list of different activities, I am going to select “House Party” – it’s a bit more informal and lively; really making a great atmosphere. Click the “Next” button and onwards to the guest list. Start by selecting a Host for the event. I generally select my own Sim. Then you can choose Sims you’d like to invite as guests. Friends, family, loved ones – who makes the cut? This particular Social Event also offers up the option to invite or hire on an Entertainer, a Mixologist or a Caterer. For a holiday party however, I don’t need an Entertainer. Rather, I’ll have my Sim play some festive holiday music from the stereo. But, I do want to invite a Mixologist to staff the bar and a Caterer to provide the yummy food. This should free my Sim a little more so they can socialize with guests and enjoy themselves. Crank up the stereo and blast the holiday tunes to set the tone for the party. Now it’s time for the party to begin! Your invited guests will soon arrive. When planning a Social Event, your Sim can achieve goals during the Social Event that unlock rewards for making the party better. I better get to partying to hit all these goals!